There is a TON of cases on the market! Dozens of brands with high-end and low-end models of cases are available. It’s hard to pick the right case if you are a demanding user, but especially if you are looking for a case that can fully support liquid cooling. More advanced users are always looking for cases that are modular, that have removable dust filters, cable management options and overall good use of their size. However, we enthusiasts have some “special needs” and there are cases that are good for liquid cooling, and those that just don’t cut it. With liquid cooling, additional space is needed for the radiators, because air cooled systems only need fan mounts and 25mm of space since almost all case fans are 25mm thick. The thinnest radiators are all 25-30mm thick, which means that you need at least 50mm of space to fit the radiator along with fans. Most mainstream cases have only 25-30mm headroom above the motherboard, which allows only fan mounting, and we haven’t even got to the 40 or 60mm thick radiators. There are even thicker radiators available, ranging up to 80mm, but those are rare and often unnecessary since there is only a fraction of cases on the market that can accommodate these super-fat radiators. Additional space is also needed for the reservoir, the pump, and the tubing. Keep in mind that the overall size of the case does not have to be bigger to accommodate liquid cooling, it’s the internal layout that needs to be just right. Evidence that powerful liquid cooled hardware can be fitted in a small form case. 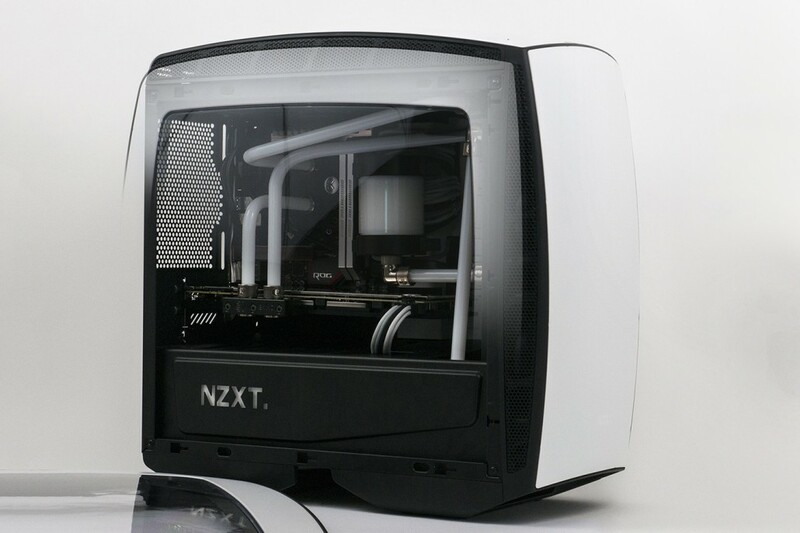 Built by Mark Tanko, EK CEO in an NZXT Manta mini-ITX case. Click here to see more. Liquid cooling actually makes it possible to pack high-end components into smaller cases. First of all, any high-performance air cooler is tall at least 150-160mm, and for that, you need a fat case. Second, small cases are cramped, which will result in bad ventilation for GPUs. By replacing stock cooler from a high-end GPU with a water block, you can free up space for an additional card. At the same time, heat is transferred away to the radiator and directly exhausted from the case, which is a win-win situation. 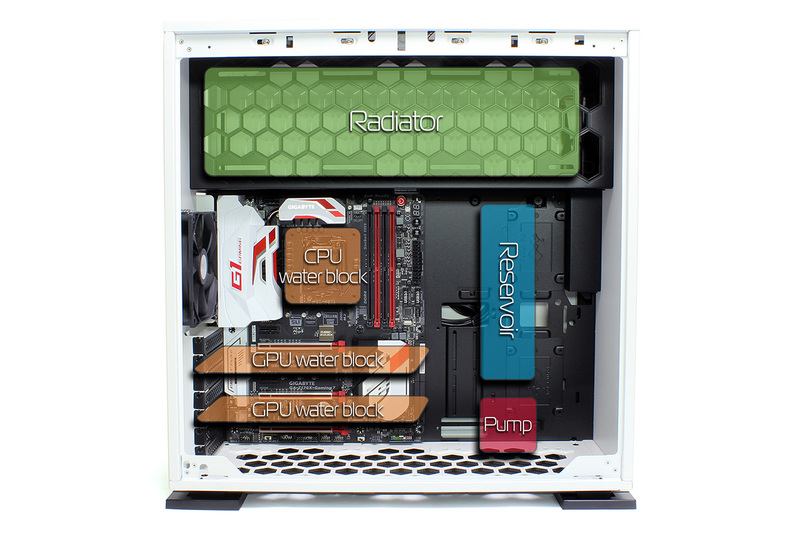 Let’s look at an example of a case that is good for liquid cooling – the In Win 303. This model can easily be one of the most affordable, liquid cooling friendly showcase enclosures on the market at this moment. In Win 303 along with 240mm radiators and a 100mm reservoir to give you the reference points so that you can perceive the case size. 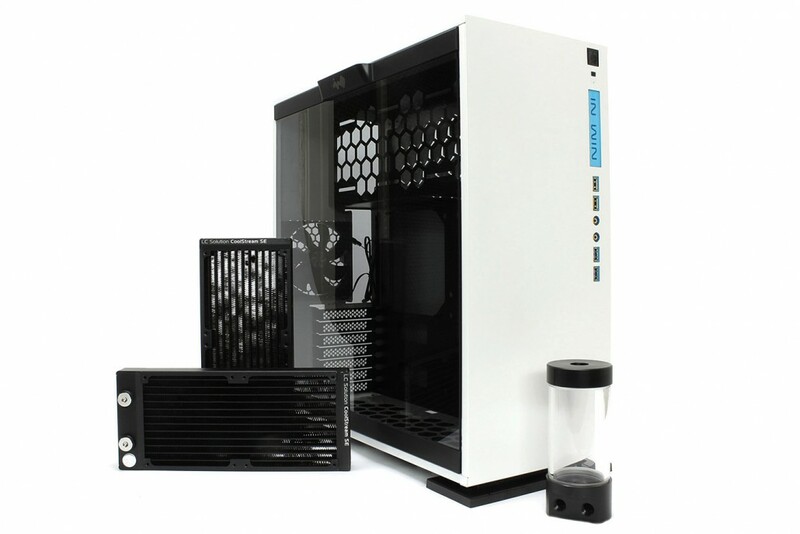 The large tempered glass side panel reveals all of the components and the top part can accommodate a 360mm radiator with a thickness of up to 45mm, like the EK-CoolStream PE 360. A radiator of this size can handle most of the available high-end CPUs and a single GPU used in one loop. The market is evolving… More and more case models are designed especially with liquid cooling in mind, with the 303 being one of them. A mid-sized ATX case is still no guarantee of compatibility with radiators, reservoirs, and pumps. You will still have to do your homework and investigate the case and what it offers. But for a quick start, we can provide you with a list of cases that are quite popular for liquid cooling. From Corsair: Obsidian 900D, Obsidian 750D, Carbide Quiet 600Q, Carbide Clear 600C, Graphite 780T, Obsidian 750D, Carbide Air 540, Obsidian 450D, etc. From Fractal Design: Arc Midi (R2), Define R4, Define R5, Define XL R2, Define S, Node 804, etc. From In Win: 303, 805, 509, 909, S-Frame, H-Frame 2.0, D-Frame, D-Frame Mini, etc. From NZXT: H440, H630, Noctis 450, Phantom 820, Phantom 630, Phantom 530, etc. From Phanteks: Enthoo Pro, Enthoo Primo, Enthoo Evolv mATX, Enthoo Evolv ATX, etc. Liquid cooling built by Brian Stroh in a Phanteks Enthoo Evolv ATX case. Click here to see more. The majority of enclosures made by CaseLabs are also an awesome choice, with some of the popular models being the following: Mercury S8, Mercury S5, Mercury S3, Magnum STH10, Magnum SMA8, Merlin SM5, Merlin SM8, etc. And remember, these are just some cases that popped into our mind, and with that said, you could leave us a comment on your preferred case for liquid cooling that we perhaps forgot to list. We have mentioned the Corsair 780T full-tower case, and we can easily call it water cooling heaven. This case can mount multiple radiators in multiple places. The top can fit a 360 or 280mm radiator, and the front can also handle the same 360 or 280mm configuration. The bottom can house a 240mm, the rear can do a 120 or 140mm radiator, and there is also ample space for a pump and a large reservoir. 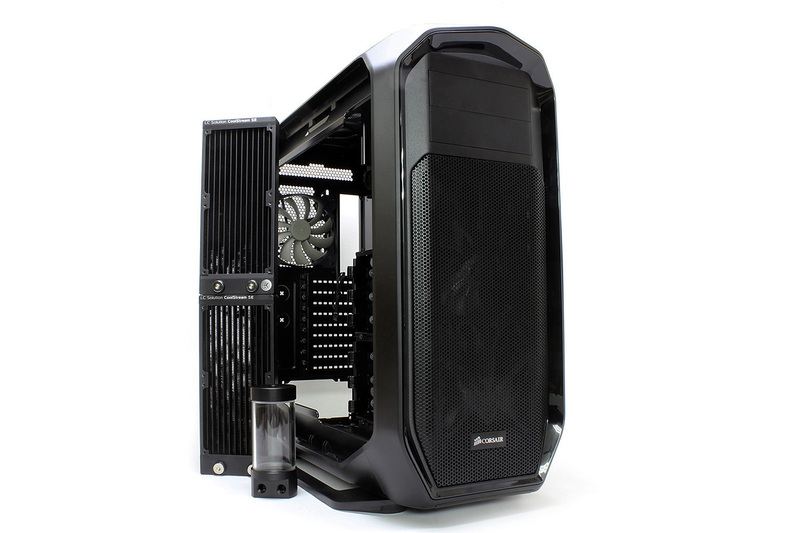 Corsair 780T along with 240mm radiators and a 100mm reservoir to give you the reference points so that you can perceive the case size. Corsair 780T can be used to liquid cool high-end setups with an overclocked CPU and multiple GPUs. It is highly ventilated and has removable dust covers on every air intake. It’s humongous inside and easy to work with, and routing tubes, soft or hard, is a breeze. There is no exact formula that decides which case is the best for liquid cooling because it all depends on your needs. You can go about it from two angles. You can first choose your case and then pick the water cooling parts, or first get the parts and then find the adequate case. Based on your choice, a smaller case would love some slim radiators and a pump + reservoir combo, while larger cases offer you more freedom. That is why EK is offering several pre-packed liquid cooling kits. Small form factor builds will love the Slim Series kits which pack a slim radiator and a small pump + reservoir combo, while larger cases can pack some of the Performance or Extreme Series kits. 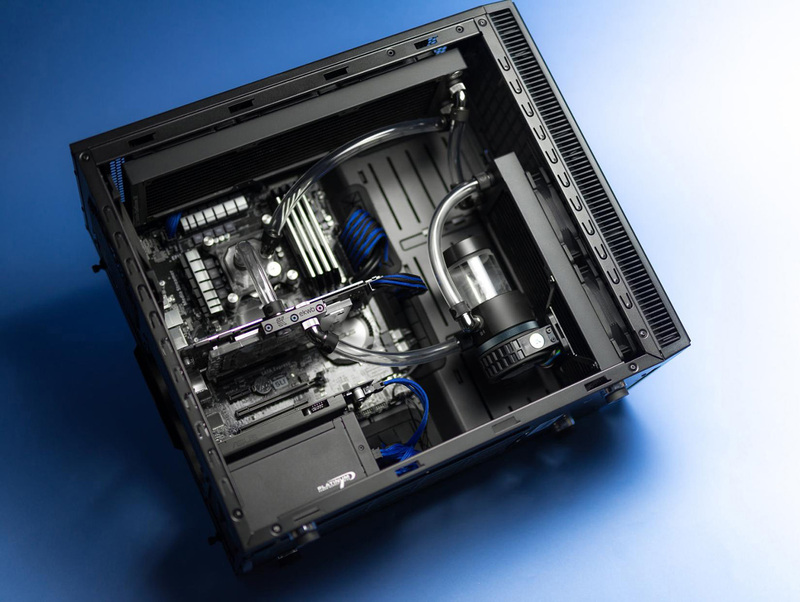 To find out more about these kits, you can read our recent blog post with the title How to choose the right liquid cooling kit? Liquid cooling system built by Malik Customs in a Fractal Design Define S. Click here to see more. Even though many high-end cases offer proper radiator support, the majority will need some intervention with a drill in order to mount the reservoir holders. On the other hand, drilling holes can be avoided by using the EK-UNI Pump Bracket with which you can mount your pump or combo unit directly on a 120/140mm fan. But still, minor modding interventions are always possible if you are building a liquid cooling setup. Probably the most important thing to say is that a 2x 120mm fan support does not equal a 240mm radiator support. Same goes for 3x 120mm fan mounts and 360mm radiator support, and all other radiator sizes. The reason for this is that radiators are always a bit bigger because of the inlet ports and the rest of their construction. The exact sizes of all EKWB radiators are listed on the web shop and you can check them out while you are browsing for liquid cooling parts. If you are an inexperienced user and you are not sure about radiator measurements or just having trouble planning, you can always make models of radiators out of styrofoam and test-fit before buying anything. 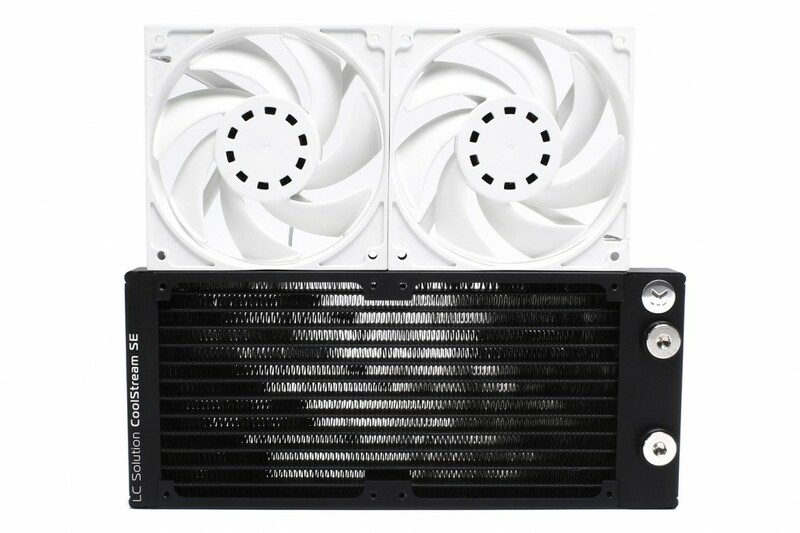 Talking about sizes, the EK-CoolStream SE 240 is 120mm wide and 280mm long. Compared to a footprint of 2x 120mm fans, roughly 12mm of the radiator hangs out on one end, and 28mm on the other end where the G1/4” ports are. The most problematic part of choosing a case for liquid cooling is probably making sure that the radiator fits. On the example of the In Win 303 we can see that the case will have no problems handling a multi-GPU system with a dedicated pump and reservoir. You can read more on the subject of combo units and dedicated pumps + reservoirs in our previous Should I get pump reservoir combo or should I buy them separately? blog post. In addition to all this, the In Win has a nice and direct air flow from bottom to top which will prevent dust build-up inside the case. Although most cases are equipped with filters, some dust will eventually end up in the case, but an even air flow can somewhat prevent this. We will probably address the never-ending debate about positive vs. negative pressure inside a case and its influence on dust build-up in one of the future blogs. Time to draw a conclusion. How to find a good case for liquid cooling? Watch the reviews, read the reviews, read user experiences on forums and that is it. Find as many reviews as possible on the case you are interested in, and focus on those where they actually put components in the case. 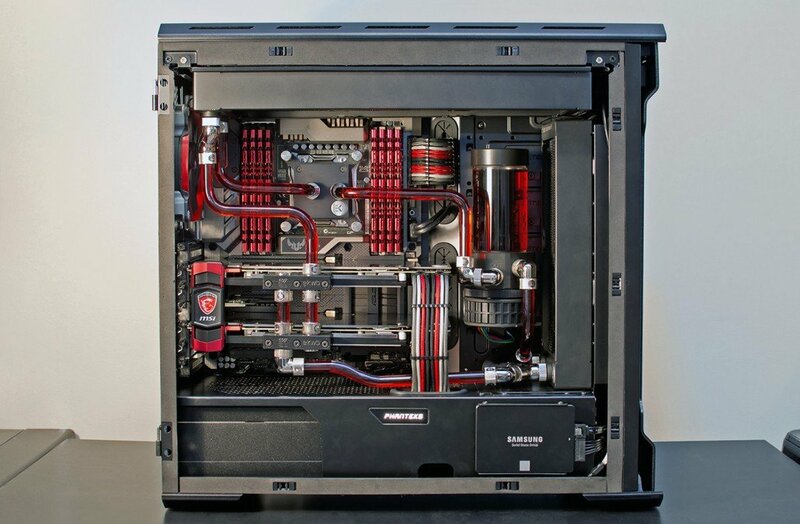 Reddit community has a great place where you can see many liquid cooling builds in many different PC cases; click here to see the gallery. When you finally decide to spend your hard earned money on liquid cooling and you are not sure about the compatibility with your case, you can always use Custom Loop Configurator or CLC, made just to ease your choice when you plan everything. Visit CLC here.